NEW YORK, March 20, 2017 /PRNewswire/ -- A Manhattan jury awarded a 30-year-old former NYU student a record-setting $39.5 million after she fell through an unguarded "vertical ladder" fire escape whose design had long been outlawed. The verdict, which cannot be appealed because it was subject to a "high-low" settlement agreement requested by the defense, will give Anastasia Klupchak $29 million as soon as next month, according to the law firm of Kramer, Dillof, Livingston & Moore which represented the plaintiff. Looking up from where Sasha Klupchak fell through the opening of the illegal vertical ladder fire escape. 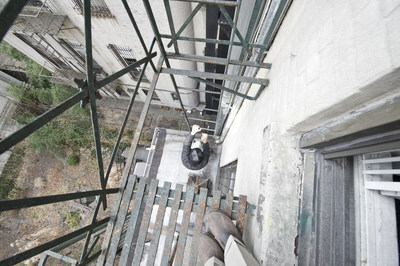 The "gap" in the platform of the vertical ladder fire escape at 82 Second Avenue. Anastasia "Sasha" Klupchak was a 22-year-old NYU honor student and varsity soccer player back in November 2008 when she was visiting a friend's fourth-floor apartment at 82 Second Avenue in Manhattan. At approximately 11:30 in the evening Sasha joined two friends out on the fire escape which was at the back of the apartment. As she turned to climb back through the kitchen window, she fell through an unguarded opening in the fire escape platform. She fell 12 feet to the roof below and sustained a severed spine. She is paralyzed from the waist down and will be confined to a wheelchair for the rest of her life. Unlike the traditional fire escapes that cover tens-of-thousands of New York City buildings, this design had no angled staircase or guard rail. Instead, it had a 34-inch gap with no handrails or guards, and people having to use it would have stretch or leap across the opening and grab the vertical ladder that led to the ground. As one juror commented after the verdict, "I have twins. I couldn't imagine putting one child unguarded on the platform while I tried to reach across the opening with the other child in my arms. No wonder this design was declared illegal." The fire escape is of a design that most New Yorkers have never seen because vertical ladder fire escapes were outlawed in 1928 by the New York State Legislature. To further emphasize the need to replace all existing vertical ladder fire escapes, the law was amended in 1948 to require that all such models had to be replaced within a year. The Plaintiff's attorney, Thomas Moore of Kramer, Dillof, Livingston & Moore in Manhattan said, "This was a shocking accident that never should have happened. 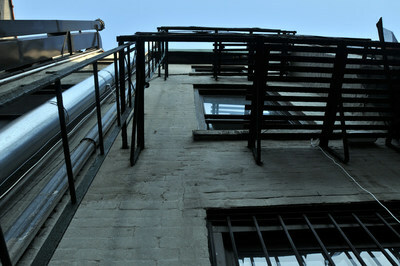 This type of fire escape has been illegal in New York since long the defendants purchased the building in 1981, and the building owners and managers knew it. Yet they allowed the fire escape to remain in place for 27 years – when the accident took place. Sadly, Sasha paid a terrible price. But hopefully, this will send a clear message to landlords through the City to replace these dangerous fixtures immediately. There are still too many of them out there." Today, Ms. Klupchak now 30, lives near Atlanta, Georgia and teaches film at Agnes Scott College in Decatur, Georgia. She expects to receive her PhD in film from Emory University in May. The building was owned by First East Village Associates, whose principal Bernard McElhone took the stand. Mr. McElhone, argued that Ms. Klupchak shouldn't have been out on the fire escape; that it was not a balcony. When pressed by Tom Moore, McElhone admitted that tens-of-thousands of New Yorkers regularly used fire escapes for other than emergency egress. He admitted under cross-examination that there was no provision in the lease prohibiting use of the fire escape for social purposes – while there was an explicit prohibition against tenants using the roof. And he admitted that it was not illegal for tenants to use the fire escape. At the conclusion of his testimony, McElhone "confessed" – a word that McElhone's own Attorney Peter Kopf tried to get the jury to ignore – that Ms. Klupchak deserved some compensation for injuries, pain and suffering. The building was sold by the defendant First East Village Associates in 2011, and the new owners soon replaced the illegal fire escape with a lawful one. This flies in the face of the defendants' argument during trial that it was not feasible to remove and replace the illegal vertical ladder fire escape. The defendants contention was based on their inability to remove a chimney that has plaintiff revealed had been inactive since long before the defendants had purchased the building; and was subsequently torn down by the new owners in order to erect the new, compliant fire escape. The jury's verdict included $32 million for pain and suffering; and $7.5 million for future medical and care needs. The total verdict was reduced by 25% because the jury decided that Ms. Klupchak should bear some responsibility. The jury of four women and two men deliberated for three days. The case was before New York County Supreme Court Justice Joan Madden and took four weeks to try. In addition to Mr. McElhone and First East Village Associates, defendants included Tri-Star Equities, the managing agent and its principal, Rod Feldman. Defense attorneys were Peter Kopf; Mark Levi of Smith Mazure; and Eric Leiter of Mauro Lilling.